Break the cycle of self-blaming. All humans are flawed and have needs. Except the narcissist. Don’t believe me? Just ask one. They’ll laundry list their super powers while pointing out and embellishing our weaknesses. Belittling and negating others is their specialty. Reducing another to an unworthy pile of insignificance; their primary goal. 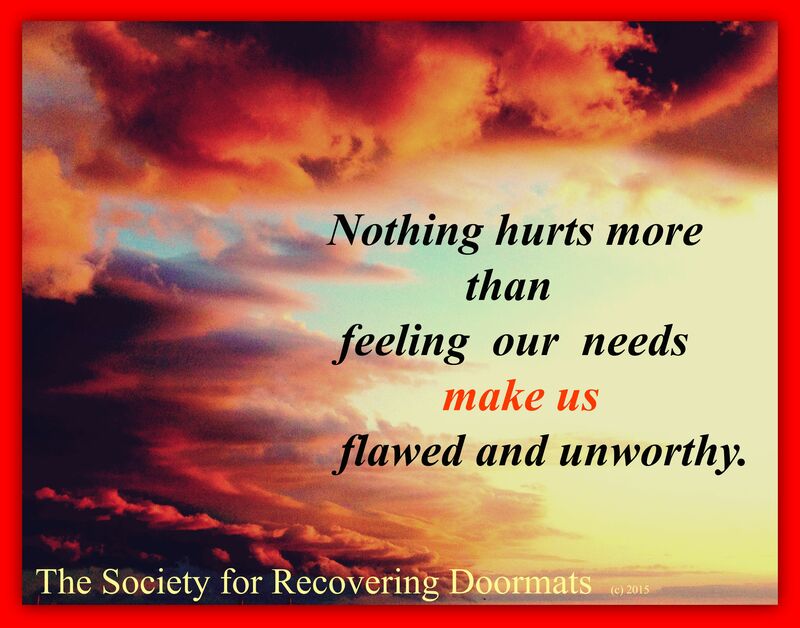 Narcissists, or ‘A’ Listers as we refer to them here at The Society for Recovering Doormats, are dangerous personalities, especially for people pleasing doormats. They are toxic to approval addicts because we’re the first to accept and internalize the terrible lies they proclaim. We think we need their love and approval and validate their vicious, self-serving talk as truth. But giving credence to their warped views, renders us ashamed and unworthy. Break the cycle of self-blaming now! The next time you’re feeling too needy and less than the wonderful person you are, remember: it’s not you! Consider instead the company you’re keeping. Chances are they are an ‘all-about-themselves ‘A’ Lister. You can’t change them but have a choice to disassociate. If this isn’t feasible because of life circumstances then disengage with them mentally and emotionally, Do not give them the power to steal your worthiness. It is every person’s birthright. There are many posts/writindpgs on this subject, but I find this one so direct and helpful — does not spend time blaming other or self. Thank you so much. I felel uplifted. This is a very powerful thing to learn and remember to practice! Thank you for spreading the awareness! Ive not been with you long, but want to thank you for writing to my heart and plainly speaking truth. I’ve finally come out of the dark of thinking I was alone in this, but wow was I wrong! Thank you for putting things into perspective with words that resonated with my soul. Thanks from one Ivy to another.